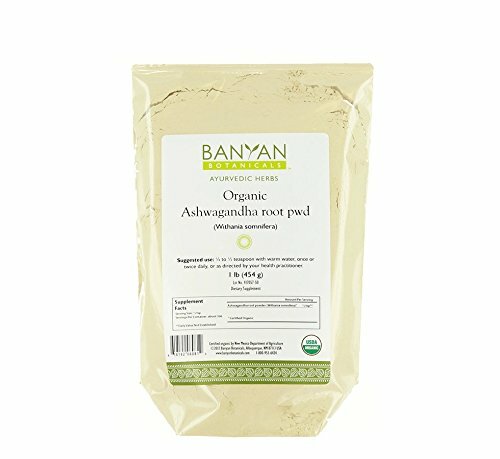 Ashwagandha (Withania somnifera) has been used in Ayurveda for thousands of years as a rasayana (rejuvenative) and an adaptogenic herb, meaning that it helps the body resist physiological and psychological stress. Ashwagandha is one of the most highly regarded and commonly used adaptogens in the Ayurvedic pharmacopoeia. Maximizing the body’s ability to resist stress, Ashwagandha enables the body to reserve and sustain vital energy throughout the day while promoting sound, restful sleep at night. It is considered one of the best herbs for calming vata and for revitalizing the male reproductive system. Used by both men and women, it maintains proper nourishment of the tissues, particularly muscle and bone, while supporting proper function of the adrenals. This potent herb is used to promote muscle strength and to support comfortable joint movement. It is also used to maintain a healthy libido, for it is said to bestow upon its user the vitality and strength of a horse. As a rejuvenative, Ashwagandha is particularly useful to seniors and for anyone that would benefit from a nourishing, natural source of energy. The Healthy Guarantee: Gauranteed to support your health or your money back!